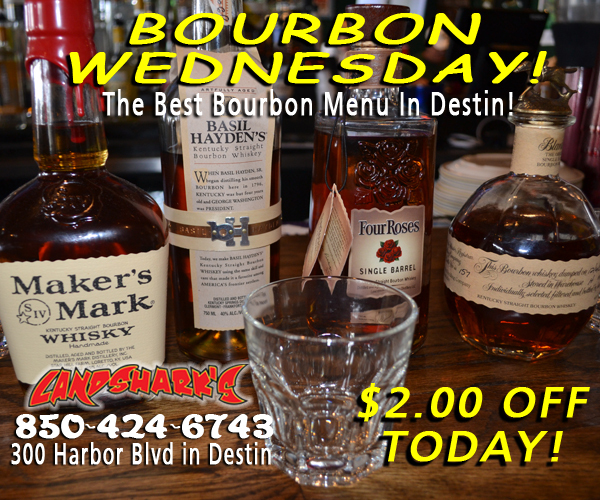 / Best Award Winning BBQ Destin FL / Landshark’s WINGSDAY WORLD SERIES|NHL|NBA & Award-Winning Wings 69¢ Ea & TOP SHELF BOURBONS $2 Off! 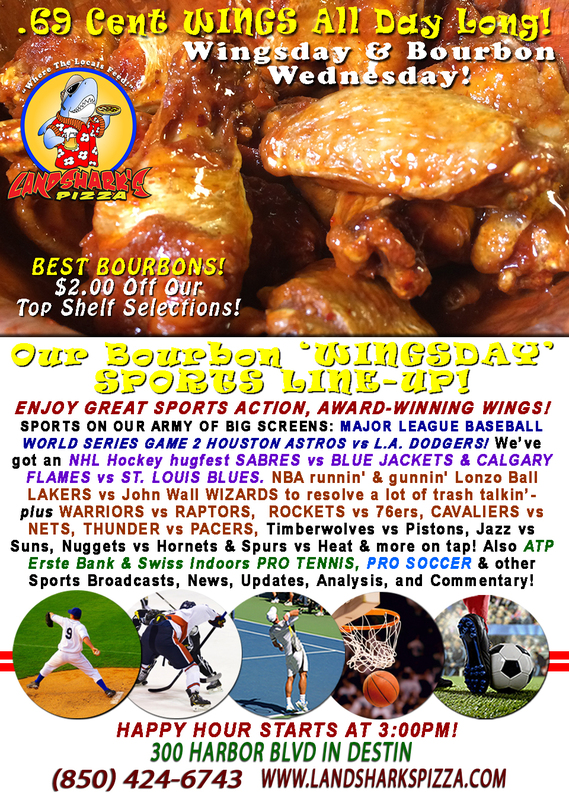 Landshark’s WINGSDAY WORLD SERIES|NHL|NBA & Award-Winning Wings 69¢ Ea & TOP SHELF BOURBONS $2 Off! 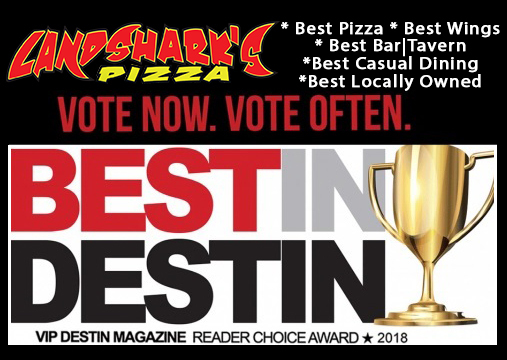 Join us at Landshark’s Pizza on a sunny Destin Humpday for mountains of tasty wings ready to go for the MLB WORLD SERIES Game 2 – Award-Winning, juicy & delicious Landshark’s Buffalo Hot Wings. Dive into a batch of mouth-watering, crispy, juicy & spicy satisfaction for only 69¢ each ALL DAY LONG! Choose from among more than 20 sauces and rubs to compliment! SPORTS ON OUR ARMY OF BIG SCREENS – WORLD SERIES GAME 2 HOUSTON ASTROS vs L.A. DODGERS! NHL Hockey hugfest BUFFALO SABRES vs COLUMBUS BLUE JACKETS & CALGARY FLAMES vs ST. LOUIS BLUES! NBA runnin’ & gunnin’ Lonzo Ball LAKERS vs John Wall WIZARDS to resolve a lot of trash talk – plus WARRIORS vs RAPTORS, ROCKETS vs 76ers, CAVALIERS vs NETS, THUNDER vs PACERS, Timberwolves vs Pistons, Jazz vs Suns, Nuggets vs Hornets & Spurs vs Heat on tap! Also, ATP Erste Bank & Swiss Indoors PRO TENNIS & PRO SOCCER action plus plenty other Sports Broadcasts, Sporting News, Analysis, and Commentary! 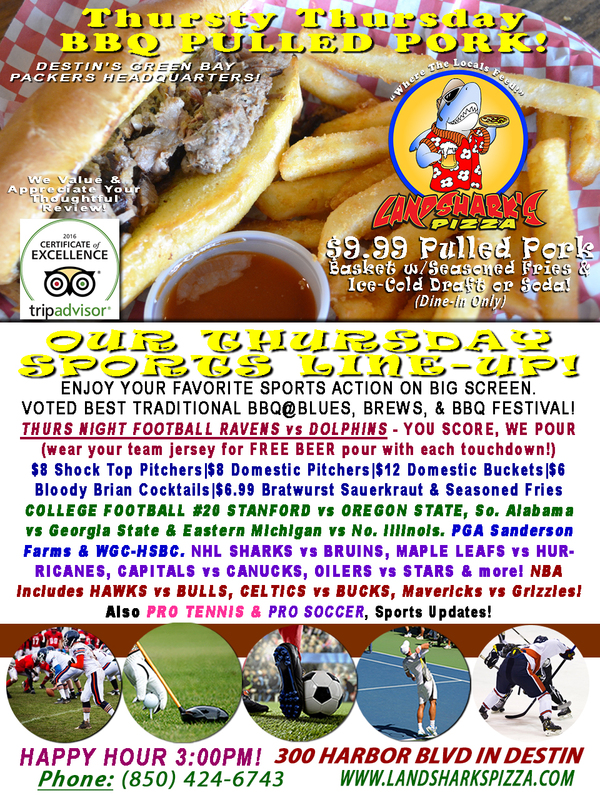 NCAAF This Week: #20 Stanford vs Oregon St. & more (Thurs)|#24 Memphis plays (Fri)|Full Schedule (Sat). Previous Post: « Landshark’s TACO TUESDAY & WORLD SERIES ASTROS vs DODGERS! 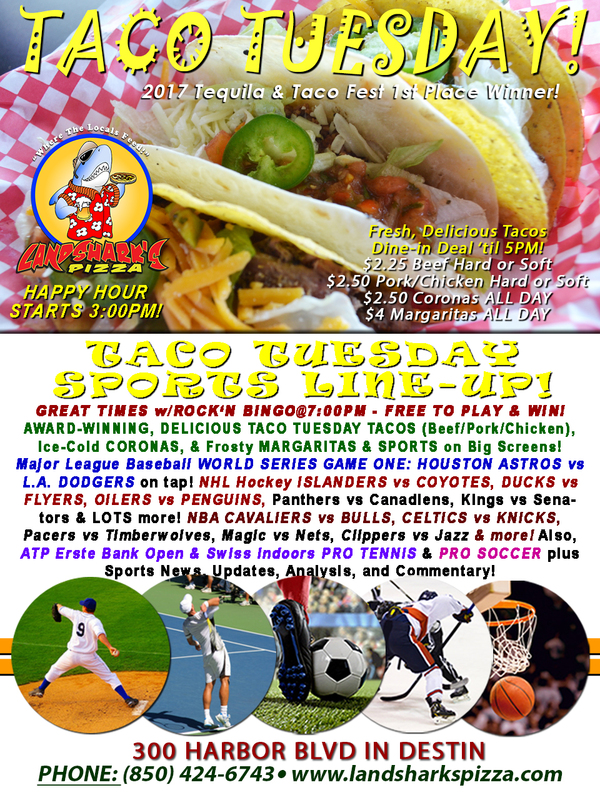 Tacos, Corona & Margarita Specials|ROCK’N BINGO@7PM!